1. 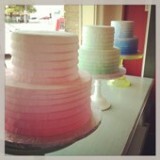 Spring inspired ombre cakes in the Society Bakery window. Spotted them when I was picking up these guys. 2. Triangles have always been my favorite polygon so I was excited when I found this necklace at Francesca's. 3. Celebrating Earth Day a little early with my first terrarium. I don't have the best track record with succulents but hopefully this time we have a winner. Learn how to make your own terrarium here and here. 5. After months of remodeling, we finally have a functional kitchen. There are still some updates to be made, but I'm pretty happy with the results so far. If you're interested in the materials and what the "before" looked like (can we say hello 1998? ), it will all be in an upcoming post. 6. Having a functional kitchen means being able to eat something that didn't come out of a microwave (that's been in my living room!) or a takeout box. Finally fired up the stove to make some Thai veggie green curry (similar recipe here). 3. Secretly happy the neon trend is not over yet. This neon yellow belt from Madewell adds the perfect pop of color (bonus: it's on sale. I can't find the yellow one online anymore but there are several glossy colors in store). I plan on wearing it with everything. 5. Spotted this fabby cas Spring outfit in the Artizia window and plan on shamelessly copying it. 6. Spring head gear: Pretty pastel and glitter hair ties from a quick Anthropologie run and Tortoise shell Ray-Ban Wayfarers courtesy of my brother. Ron Burgandy: Stay classy, San Diego. I'm Ron Burgandy? It's hard not to quote Ron Burgandy when you take a trip to San Diego. ("Mmm. San Diego. Drink it in, it always goes down smooth"). I was lucky enough to take a quick weekend getaway and it was the perfect mix of beach walks, great food and taking in the sights. It's a San Diegooooo insta-PR. 6. A romantic snowman at the beach behind the historic (and if you believe in it... the haunted) Hotel Del Coronado. Not pictured, but this insta-PR would not be complete without mentioning the Marine Room in La Jolla. Enjoying a meal during high tide is a must. RW and I had the pleasure of meeting the fabulously stylish blogger Kendi of Kendi Everyday at her cute McKinney Square boutique. If you are in the area, be sure to check out Bloom for some great finds (once you visit, it's easy to see why D Magazine named it one of the ten best boutiques in Dallas) If you're a fan, you will feel like you're literally shopping Kendi's uber fashionable closet. Ceramic ones from West Elm and their slightly meaner cousin from Petals and Vines. With cooler weather here, I was not quite ready to give up my summer stripes. This blazer (very similar to the J.Crew Maritime version that sold out so fast) is the perfect tailored look in a comfy knit. 4. New Orleans style beignets with cappuccino sauce at Toulouse. The perfect dessert to a long, drawn out Sunday brunch. Fall means new school supplies, right? If I wasn't careful, I could turn this whole site into one about office supplies, but I make sure to restrain myself. Rainbow colored tabs make reading (even a textbook) more fun. 1. Special edition of Domino magazine. Is it weird that I am only allowing myself one page a day to make the rare Domino goodness last longer? 3. The perfect striped tee dress for Spring (the blue one I have above is sold out online but available in stores) See it styled by Refinery 29 here.